Thank you for visiting this page, created especially for potential customers of Poweroll rollers from outside the UK. The majority of sports clubs buy a roller with the next 30 years or more in mind, so it might as well be the roller most suited to your needs, because you are unlikely to change it once purchased. ASK FOR A POWEROLL CATALOGUE, emailed in PDF format. 16 sides of A4 sized paper with information on all new models, specifications, options and prices. It has a Frequently Asked Questions page, useful for those tasked with sourcing a new roller but not knowing much about them. It includes reasons for buying a new dedicated grass roller rather than a pre-used road roller. Buy direct from us in the UK or buy from your local machinery dealer – it’s up to you. Whichever way you decide is best for you – and there are some benefits to either method, these are discussed in greater detail. Finally, the printed catalogue is also a very useful tool for passing around at committee meetings, so everyone can join in the conversation. If you think Poweroll rollers are going to be expensive because they’re built in the UK – think again. Poweroll rollers are considered competitively priced - even in the UK! Concerned about shipping costs? It’s not worthy of concern - it costs more to transport a machine across land than across oceans. Don’t believe us? Contact us – get a quote for a roller delivered to your nearest port or delivered direct to your ground. 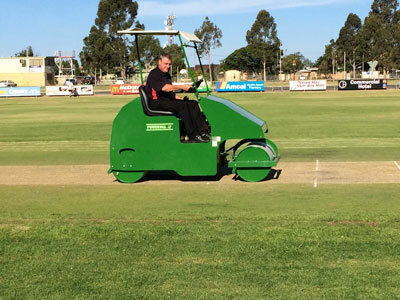 GO ON –ASK FOR A CATALOGUE– IT WON’T COST YOU A CENT, BUT COULD BE THE START OF YOUR CLUB GROUND GETTING A BRAND NEW CRICKET ROLLER AT A FANTASTIC PRICE, SUPREMELY CAPABLE OF PRODUCING SUPERB WICKETS!